On behalf of all Americans who seek a new direction, who yearn for a new birth of freedom to build the just society, who see justice as the great work of human beings on Earth, who understand that community and human fulfillment are mutually reinforcing, who respect the urgent necessity to wage peace, to protect the environment, to end poverty and to preserve values of the spirit for future generations, who wish to build a deep democracy by working hard for a regenerative progressive politics, as if people mattered -- to all these citizens and the Green vanguard, I welcome and am honored to accept the Green Party nomination for President of the United States. The Green Party stands for a nation and a world that consciously advances the practice of deep democracy. A deep democracy facilitates people's best efforts to achieve social justice, a sustainable and bountiful environment and an end to systemic bigotry and discrimination against law-abiding people merely because they are different. Green goals place community and self- reliance over dependency on ever larger absentee corporations and their media, their technology, their capital, and their politicians. Green goals aim at preserving the commonwealth of assets that the people of the United States already own so that the people, not big business, control what they own, and using these vast resources of the public lands, the public airwaves and trillions of worker pension dollars to achieve healthier environments, healthier communities and healthier people. These goals are also conservative goals. Don't conservatives, in contrast to corporatists, want movement toward a safe environment, toward ending corporate welfare and the commercialization of childhood? Don't they too want a voice in shaping a clean environment rooted in the interests of the people? Don't they too want a fair and responsive marketplace, for their health needs and savings? Let us not in this campaign prejudge any voters, for Green values are majoritarian values, respecting all peoples and striving to give greater voice to all voters, workers, individual taxpayers and consumers. As with the right of free speech, we may not agree with others, but we will defend their right to free speech as strongly as we do for ourselves. Earlier this year, I decided to seek your nomination because obstacles blocking solutions to our society's injustices and problems had to be overcome. Feelings of powerlessness and the withdrawal of massive numbers of Americans from both civic and political arenas are deeply troubling. This situation had to be addressed by fresh political movement arising from the citizenry's labors and resources and dreams about what America could become at long last. The worsening concentration of global corporate power over our government has turned that government frequently against its own people, denying its people their sovereignty to shape their future. Again and again, the will of the people has been thwarted and the voice of the people to protest has been muted. In the past, citizens who led and participated in this country's social justice movements faced steep concentrations of power and overcame them. A brief look at American history is instructive today. Common themes occur from the Revolution of 1776 against King George III's empire to the anti-slavery drives and women's suffrage movements of the 19th century, to the farmers' revolt against the large banks and railroads that began in 1887, and on to the trade union, civil rights, environmental and consumer protection initiatives of the 20th century, culminating in the demands for equity by Americans who are discriminated against due to their race, gender, tribal status, class, disability or sexual preference. All these movements took on excessive power, pressed for relinquishment or sharing of that power despite vigorous opposition by elements of the dominant business community. Many years were lost to the resolutions of these injustices before justice began to prevail and corporate power receded. However, when citizens won, and Tory merchants, cotton slave holders and corporations were compelled to share that power with the people they oppressed or excluded, America was a better place for it. America became more beautiful. Moreover, the companies behaved better and prospered more. Over the past twenty years we have seen the unfortunate resurgence of big business influence, generating its unique brand of wreckage, propaganda and ultimatums on American labor, consumers, taxpayers and most generically, American voters. Big business has been colliding with American democracy and democracy has been losing. The results of this democracy gap are everywhere to be observed by those who suffer these results and by those who employ people's yardsticks to measure the quality of the economy, not corporate yardsticks and their frameworks. What we must collectively understand about the prevalent inequalities is important because so many of these conditions have been normalized in our country. Over the next four and one half months, this campaign must challenge the campaigns of the Bush and Gore duopoly in every locality by running with the people. When Americans go to work, wondering who will take care of their elderly parents or their children, irritated by the endless traffic jams, stifled by their lack of rights in the corporate workplace, ripped off by unscrupulous sellers and large companies, put on telephone hold for the longest times before you get an answer to a simple questionso much for this modern telecommunications age, beset by having to pay for health care you cannot afford or drug prices you shouldn't have to suffer, aghast at how little time your frenzied life leaves you for children, family, friends and community, overcome by the sheer ugliness of commercial strips and sprawls and incessantly saturating advertisements, repelled by the voyeurism of the mass media and the commercialization of childhood, upset at the rejection of the wisdoms of our elders and forebears, anxious over the ways your tax dollars are being misused, feeling that there needs to be more to life than the desperate rat race to make ends meet, then think about becoming a part of a progressive movement of Greens, of this citizens' campaign, to change the political economy so that healthy environments, healthy communities, and healthy people become its overwhelming reason for being. Look at Europe. During the Fifties and Sixties, several European countries provided all their citizens with health care coverage, day care and other services for children, labor laws which facilitate the organization of trade unions, a statutory "social wage" for all workers, union and non-union, providing one month paid vacations, retention of pay while caring for sick family members, pensions and other services. In the year 2000 A.D., most workers in our country do not have these basic rights. In fact, according to the World Health Organization, the United States was ranked 37th among nations in the world regarding the quality of health care a country provides its people. This is not only embarrassing but also unacceptable. Western European countries provided for their people thirty to fifty years ago. Why can't we do it now in a period of economic boom? It's possible. We can make a difference. Together we can chart a new course. However, what we must first do, as I mentioned already, is to collectively understand the inequalities afflicting so many of our citizens to translate this understanding into a demand for solutions. What is so normalized now must now be defined as intolerable and unworthy of this great country of ours. A collective understanding must distinguish peoples' yardsticks to measure the quality of the economy from corporate yardsticks. Consider business money in politics which overpowers labor money by eleven to one. Corruption reaches new peaks every two years and further nullifies what the voting franchise is supposed to mean. What about the bragging about the economy's nearly ten straight years of spectacular performance? Try applying people's yardsticks instead of the measures of record GDP, corporate profits and stock exchange prices. A very different picture emerges. Because the benefits of this boom have accrued to the wealthier and especially wealthiest classes, the majority of Americans are left behind. There is over 20 percent child poverty, 25 percent for pre-school children. This is by far the highest percentage among comparable countries in the western world. There are about 47 millions workers, over one-third of the workforce, making less than $10 per hour, many at $5.25, $6.00, $7.00, with no or few benefits. The majority of workers still, after ten years of overall economic growth, make less today, in inflation adjusted dollars, and work 160 hours longer per year than workers did in 1973! Moreover, today's workers have to spend more to get to work and commute longer distances. They pay more for what were family functions that were once free or inexpensive. A record number of people are without health insurance. $6.2 trillion in consumer indebtedness to supplement living wages, and inadequate crumbling public works that serve the mass populace, from schools, health clinics, mass transits, drinking water systems and other services. The lower unemployment rate is masked by low wages and millions of part-time laborers who are registered as employed if they work 21 hours a week and cannot get a full-time job. The need for more than one job to pay one's bills, the fear and reality of medical expenses for the uninsured , the growing distance between home and job, home and shopping, the lack of affordable day care all combine to form a daily, exhausting frenzy with less time for children and community. Who designed this economy anyway? Was it topsy or was it economic forces beyond the control of regular people? An economy that grows with more ways to leave people behind raises the question of what will happen when a recession or worse occurs? Then, there is the people's yardstick for individuals who pay most of the taxes to their governments. Given proliferating corporate tax shelters, trillions of dollars in corporate and individual tax havens overseas, corporate income tax contributions to the federal treasury are well under ten percent, notwithstanding awesomely record profits. Between 1981-83, a worker in a General Electric plant or office paid Uncle Sam more in actual total dollars than did giant GE which paid no federal income taxes on over $6 billion in profits and received a refund to boot. In 1941, Supreme Court Justice Louis Brandeis made a prescient observation when he wrote: "We can have a democratic society or we can have the concentration of great wealth in the hands of the few. We cannot have both." Today, that concentration of wealth and its political power has reached stunning intensities. In large companies, people who work in the same enterprise are now earning $1 for every $416 that the CEO takes away. In 1940, it was $1 for every $12. Today the financial wealth of the top 1 percent of households exceeds the combined wealth of the bottom 95 percent of American households. Earlier this year Bill Gates' wealth was equal to the combined wealth of the poorest 120 million Americans. Whatever this enormous imbalance says about the Great software imitator from Redmond, Washington, it means that about tens of millions of Americans, who work year after year, decade after decade, are nearly broke. What democracy worth its salt would have led to this profound inequity? Globally, the combined annual income of the world's poorest 3.5 billion people equals the world's two hundred richest people who more than doubled their net worth between 1996 and 1999. The net would be much smaller were other forms of corporate welfare such as subsidies, erased corporate debts to Uncle Sam, giveaways and bailouts to be subtracted. Of course, small businesses don't have such complex shelters to avoid taxes. When small businesses get into trouble, they are free to go bankrupt, unlike speculating, mismanaged or corrupt big businesses that can go to Washington for a complex bailout. What about measures of environmental devastation? These don't appear on the balance sheets of Exxon, DuPont, General Motors, or Peabody Coal. Degrading the air, water and soil that we use does not register with any reports of such companies. Global warming, ozone depletion, oceanic deterioration and forest clear-cutting do not have company logos on them. GE still has not been held responsible for the PCB poisoning of the Hudson River and got away with a trivial charge for what it did to my home area's Housatonic River. A low level flight across the USA would reveal the enormous wounds and scars, toxic hotspots, runoffs and dumps exacted by the timber, mining, paper, chemical and metals industries, taking out the livability of entire communities and their legions of worker-victims. More coal miners have lost their lives from black lung disease and mine collapses in the past 110 years than all the American lives lost in WWII. And that is just one industry's casualty toll. The epidemic of silent environmental violence continues. Whether it is the 65,000 Americans who die every year from air pollution, or the 80,000 estimated annual fatalities from hospital malpractice, or the 100,000 Americans whose demise comes from occupational toxic exposures or the environmental racism where the poor and their often asthmatic children live in pollution sinks, to cite a few preventable conditions. The mortality and morbidity toll is far in excess of the appalling street- level homicide numbers that amount to about 20,000 annually. The corporate youth addictors, tobacco and alcohol, the deliberate over-medicators, bear some responsibility for yet more fatalities and sicknesses. The economic indicators preferred by Chairman Alan Greenspan and most politicians from the two parties exclude much more that matters to people: consumers who are defrauded, injured and killed by hazardous or mis-sold products and services such as drugs, medical devices, vehicles, pesticides, flammables, medical malpractices, insurance and bank reports, credit, low income repair and loan scams. These tragedies are ignored, although they do sometimes come before the courts and are covered in excellent major media investigative features. Then, to the chagrin of the dutiful reporters, too often nothing happens. The percentage of union members in the private economy has just dropped below 10 percent, the lowest in 60 years and the lowest percentage in the western world. This indicator of people's plight explains much more about why many workers do not earn enough to support their families, why they have to bear more of the health insurance premiums, if they receive any from their employer, and why they go without or endure shrinking retirement benefits. What we must achieve is a stronger democracy to turn all these deplorable conditions around. Because we know from our own inner strength and knowledge as a nation and from the experiences of our courageous forebears who surmounted their injustices, we can and we must. Just as with past resistance, the dominant business lobbies are saying no to advanced consumer protection, no to environmental law enforcement, no to an end to corporate welfare on the backs of taxpayers, no to worker's rights to decent living standards and safer workplaces. Simply read the mainstream press, along with stalwart smaller publications such as the Nation, Washington Monthly, Harpers, Atlantic Monthly, The Progressive magazine and the Progressive Populist, to name a few, and you will have your evidence, your heart-wrenching reports, your manifest injustices. All this signifies the gradual closing down of civil society symbolizing an underdeveloped democracy and an overdeveloped plutocracy or corporate state, in short, business acquisition of government to serve its insatiable short-term interest. This country has more problems than it deserves and more solutions than it uses. Because our democracy is underdeveloped, there is little accountability. The corporate commercialization of our country, our government, our universities, our schools, our youngsters, our very expectation levels continues unabated. Health, safety, justice, education, respect for the environment and future generations are subordinated to boundless greed and commercialism. Much of our foreign policy is driven by unsatiable corporate pressures to sell military hardware to both the Defense Department and directly to foreign dictators. This happens even if it goes against the interests of our country, taxpayers and the principle of prudently allocated public budgets. Weapons manufactures foist weapons systems onto the Pentagon, working through a PAC-greased, supine Congress. Lower level Pentagon analysts are left to fume in private, powerless to stop the waste and distortions of our policies. There is more to collectively understand. Corporatization is fast going global with autocratic support structures such as the World Trade Organization (WTO). The WTO undermines our legitimate local state and national sovereignties which enable America to lead the way in worker, consumer, environmental standards. Global corporations command the capital, technology, labor and many governments. How have they used this unprecedented supremacy to alleviate the world's problems? The big drug companies avoid research into global infectious diseases, such as malaria and TB, that claim millions of lives a year and are heading to our shores in drug resistant form. Despite adverse publicity over their duplicitous behavior, the tobacco companies are straining to hook every possible youngster in the Third World with portents of massive cancer and other tobacco-related deaths yearly. The munitions makers are busy expanding their lethal export trade, using your tax dollars in the form of subsidies. The food processing giants and the fast food chains are busy displacing indigenous foods with fat and sugar pumps a la McDonalds fast food. At the same time, the biotechnology companies drive to change the nature of nature without answering basic scientific or need questions. The banking giants and their IMF and World Bank cohorts are continuing their structural adjustment polices in Third World countries that cut public budgets, end critical consumer subsidies and replace real food acreage with cash crops for exports, while imposing environmentally damaging megaprojects that enrich the local oligarchy. The timber companies, working directly or through local firms are rapidly destroying the rich biological diversity of the equatorial forests. The large energy companies want these countries to buy more nuclear and coal-burning plants, develop the same fossil fuel-nuclear alliances that undermine local renewable solar technologies and energy efficiencies. By cutting such deals and supporting dictatorial regimes and the domestic oligarchies, democratic developments that would help the people, for example, land reform, agrarian credit, cooperatives, trade union rights, and political reforms are stymied and destroyed. These conditions come back to plague us one way or another, as in the billions of wasted taxpayer dollars Congress has appropriated for the International Monetary Fund. When we overspend on munitions, the arms companies make money. Should we wage peace through preventative diplomacy and defense, they would make very little. One would think with the demise of the Soviet Union ten years ago, we would have had that Peace Dividend allocated to improve peoples lives. Fifty years after World War II, tens of thousands of our troops are still in Europe and East Asia, defending prosperous nation allies who are fully capable of defending themselves against non-existent enemies. Yet, useless massive weapons systems remain on the drawing boards to further mortgage our fiscal future and drain money and talent from long overdue civilian projects. At home our criminal justice system, being increasingly driven by the corporate prison industry that wants ever more customers, grossly discriminates against minorities and is greatly distorted by the extremely expensive and failed war on drugs. These prisons often become finishing schools for criminal recidivists. At the same time, the criminal justice system excludes criminally behaving corporations and their well defended executives. A most insidious influence of corporations is their way of making us feel powerless, as did the auto industry for so many years. They did this by withholding information on better ways to build cars that they know how to design. We grow up corporate, thinking that this is the way things are and that will always be and reducing our expectation levels in the process. It was Ford Company Vice President William Gossett who wrote in 1959 candidly, that the modern corporation is the dominant institution in our society. I grew up corporate at a time of the ascendancy of the motor vehicle highway expansion and the deliberate tearing up of the electrified trolley system (by GM and company) and blocking new systems of public transit. Research information about unsafe cars, sponsored by the Department of Defense, because soldiers were dying in highway crashes here at home in large numbers, liberated my civic perspectives. Good things happened. As a nation, in 1960 we started to raise our expectations about what levels of safety, emission controls, fuel efficiency should come with motor vehicles. As a result of federal regulation, motor vehicles became much safer than they were and millions of casualties have been prevented since then. The options were much wider than we had been led to believe. We can remind ourselves that through our state governments, we give business corporations the charter that brings them into existence. We can, therefore, as was done in the 19th century, condition this charter on good behavior and withdraw the charter for recidivist companies which then become subject to trusteeships for rehabilitating the companies with new leadership. Bad trade unions had to undergo such rehabilitation. Ultimately, it is always the people who bear the fundamental responsibilities to correct the course of their societies and their wayward institutions. One of those critical responsibilities is to ensure that our children are well cared for. This is an enormous undertaking because our children are now exposed to the most intense marketing onslaught in history. From the age of 9 months to 19, years precise corporate selling is beamed directly to children separating them from their parents, an unheard of practice formerly, and teaching them how to nag their beleaguered parents as unpaid salesman for companies. There is a bombardment of their impressionable minds. Through television, the Internet stores, samples and mailings, these companies convey their message to the little ones. They teach them how to crave junk food, thrill to violent and pornographic programming, interact with the virtual reality mayhem. The marketeers are keenly aware of the stages of child psychologies, age by age, and know how to turn many into Pavlovian specimens powered by spasmodically shortened attention spans as they become ever more remote from their own family. Conditioned to become gazers and spectators for an average of 30 hours a week, youngsters now register as more obese and out of shape than any previous generation since 1900 when such records began to be collected. Their teachers see the results of this addictive commercial exploitation, the rat pack product conformity, the intrusion of commerce into the schools themselves. This does not prepare the next generation to become literate, self-renewing, effective citizens for a deliberative democracy. Instead, this commercial traffic makes them even more vulnerable to the streets. So offensive are these intrusions to the basic norms of nurturing a wholesome childhood that people, conservative and liberals alike are joining together to protest, demand restraints and encourage a wider association of adults, including retired adults, with children. There are good reasons why every major religion long ago warned about giving too much power to the merchant mind. Why? Because its singular focus and its self-driven impulses run roughshod over the more non-commercial values that define a worthy society. How badly do we want a just and decent society, a society that raises our expectation levels about ourselves and our community, a society that foresees and forestalls future risks, a society that has the people planning the future of their country, not global corporations as is the case now? A just and decent society is the dream of all those good citizens across our land who fight the good fight daily, it is the dream of the Green Party, it is the dream of a growing number of people seeking to involve themselves more actively in reclaiming this democracy of ours. This campaign is about strengthening our Republic with "liberty and justice for all" so that freedom is defined as participation in power: power to solve our problems and diminish our injustices that cause such pain and stultify so many Americans and their children. It is good to have such dreams, my mother would tell us, but she added a challenge. She taught us that determination puts your dream on wheels. Together we reviewed the problems and have understood that inequalities are getting worse. Together we can change the course of events as our forebears did. With commitment, dedication and determination we can put our dreams on wheels in this campaign. The people of this country have options. There are more citizen organizations and individuals knocking on the doors of their governments than a government responding. This means we must persist until we prevail. There are hopeful signs across the country as this campaign is demonstrating. We are campaigning all over the country with citizen groups on the ground who are working to lift standards of living and quality of life. The tide is starting to turn. Last year our campaign promised to journey to all fifty states. I am the only Presidential candidate to have completed campaigning in every state of our country since the first of March. In Boise, Idaho, recently, a reporter asked me: "Since Bush is expected to win Idaho and Gore has essentially conceded Idaho, neither of them are coming here, why did you? "Because," I replied, "if you're going to run for President of the United States, you should campaign in every one of our states." Campaigning with the people in all the places we visited is illuminating and heartwarming. The impulse for changes as if people mattered are visible everywhere. Let me share some examples. In Toledo, Ohio, we joined with members of a community of some 80 householders and 16 small businesses taken by the City, under threat of eminent domain, to provide Daimler/Chrysler with a landscaping area. Already, the cowed city had given Chrysler ample acreage for its Jeep Plant. The city of Toledo cleared the land for the giant company, absorbed any environmental liabilities, gave Daimler/Chrysler a long tax holiday as part of a nearly $300 million package in federal, state and local subsidies. The auto company got the additional land it wanted for its shrubbery and a long-time cohesive neighborhood was utterly demolished just like Detroit's Poletown in the 1980s. A World War II veteran told us that when he was fighting the fascists, he never dreamed his long-time home would be taken for corporate shrubbery. In stark contrast, Daimler/Chrysler, recording record profits, had $20 billion cash in the bank. In Madison, Wisconsin, we marched with workers picketing for a livable wage. They were working for an independent contractor who provided services for the University of Wisconsin. In Atlanta, we stood in solidarity with a large homeless shelter in the downtown Business District where homeless people are not supposed to be seen. The city has not given the Shelter a kitchen permit for two years. In Nashville, Tennessee, I met Tom Burrell, now running for the U.S. Senate on the Green Party line. Mr. Burrell returned from Vietnam to work in the auto industry and then came home to Tennessee to farm a large tract of land. There he learned about the shocking state of Black farmers in America, dispossed of most of their land and forced to give up their farms over the last seventy years, in no small part due to blatantly discriminatory behavior by the U.S. Department of Agriculture. The Department is only now offering to make inadequate amends. Mr. Burrell has been a transforming leader of these farmers seeking recompense and land. We had reported on this situation nearly 30 years ago. In Boston, right next to Fenway Park, we gathered with members of the neighborhood at a news conference. The issue was a forthcoming demand by the Boston Red Sox organization that some $300 million in tax monies be used to help build a new ballpark nearby. The neighborhood groups, disturbed by diversion of tax dollars from neglected needs of the city, wondered why renovation of this historic park was not wiser than demolition. Did not the Red Sox learn from the experience of the New England Patriots football team who were sent fleeing back to Boston after their $500 million bonanza for a stadium in Hartford was successfully blocked? There, an aroused citizen coalition spearheaded by the Connecticut Green Party effectively routed the power of a determined executive-legislative alliance by the Republicans and Democratic parties. In Montana and Idaho, we heard unassailable arguments that stopping the logging in national forests made superior environmental, economic and job sense. Enjoy these forests now and for future generations rather than destroy them for 3 percent of the nation's annual timber harvest and $1.2 billion of annual taxpayer subsidies to the timber barons. "Let the Forests breath for us," America's great environmentalist, David Brower told us. In Hartford, Connecticut's grim inner city amidst the office buildings of the affluent insurance companies, we met with clergy from the Churches and social activists and discussed what this so called booming economy has left behind in misery, deprivation and neighborhood heroics. In Nebraska and Iowa we learned about the shocking crisis of much rural farm country where small farmers and ranchers, despite working from dawn to dusk, cannot make a living. They are being mercilessly squeezed by giant suppliers and giant buyers, who are relentlessly driving toward an industrialized corporate-contract agriculture mutated by genetic engineering. In Hawaii, we visited one of the only two plots in the United States (the other is on the Pine Ridge Reservation) legally permitted to grow industrial hemp, that 5000 year old, versatile plant with thousands of uses, including textiles, fuel, food and paper. A fraction of an acre was surrounded by barbed wire fence, saturation night lights inside a larger fenced area. This medieval experience brought home once again that for the sake of farmers, the environment, consumers and energy independence, it is necessary to free industrial hemp from the proscribed list of U.S. Drug and Enforcement Agency. In West Virginia, the misbehavior of King Coal is painfully visible. Some coal companies think nothing of blowing the tops off of mountains and producing a polluting rubble and consequent jamming of streams for many miles. Imagine! Against prevailing public opinion, King Coal is dynamiting mountains, whose lore and beauty formed the natural space for the mountain people. There was no objection from the Clinton-Gore Administration. Similarly, the company that operates the giant incinerator, an extremely hazardous polluter in southwestern Ohio benefitted from the broken promises of the Clinton-Gore team made in 1992, to the citizen groups that fought and continue to fight to shutdown the incinerator. From Minnesota, my vice-presidential running mate, Winona LaDuke and called a conference of tribal leaders about the need to respect Treaties, and end the budgetary and other discriminations against the impoverished reservations. This is long over due. Around the country from Delaware to Kentucky to Oregon to Minnesota, we joined with students deeply involved with the anti-sweatshop movement and with workers who have lost their jobs to these sweatshops abroad. We surveyed and confirmed the need for modern public transit and the wonderful new technologies that community groups were demanding to enable low- income people to get to work and to relieve the enormous time wasted in chocking bumper to bumper traffic. We spoke with nurses from coast to coast about furthering their leading role in advancing patients' rights, the quality of health care and universal health care for all. 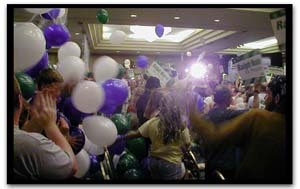 And, a tip of the hat to the California Nurses Association, the standard-setter for unions everywhere, for being the first union to support this Green Party Presidential campaign. How uplifting were our conversations with peace and nuclear arms reduction groups whose members, most of them sagacious, experienced and determined elderly women and men whose concern is first and foremost for the "Seven Generations" ahead. They set a new standard for grandparenting. We should recall that the nuclear freeze movement began in town meetings in New England. We saw struggling small businesses, the Main Street core of their community, slipping before the onslaught of the Walmarts and other giant chains that have privileges not available to these merchants. We met with volunteers and donors at receptions filled with civic activists excited over the premises and promise of an expanding Green Party. It would take about one million Americans, pledging 100 volunteer hours a year and raising $100 a year, advancing a broad and deep agenda for the just society congenial to millions of other Americans, to establish a majority political Party in a few years. The citizens of this country are not a backdrop for political maneuvering by big business. They are central to a democratic politics. They are central for reality testing, to help the politicians stay close to growing inequalities because politicians can insulate themselves by design. Did we really need a World Health Organization report to tell us how badly we stand on health care issues? Big money in electoral politics produces a kind of institutional insanity. This campaign will set an example of what can be accomplished with the honest dollars of individuals, by refusing to take PAC money or use soft money. This is a sane choice, now and in the future. It offers the citizens of this country an authentic role in defining and solving problems. A progressive political party is most authentic when it connects with or arises from citizen movements and does not forget where it is coming from or the reason for its being. Major changes for the betterment of human beings start with major changes of direction. Such changes start with small steps taken by each individual and their community together with other individuals and these small steps evolve into ever larger steps which are thereby more tested and surefooted. The question we have to ask of ourselves is how badly, how urgently do we want these changes? Do we want public financing of public elections, which will remove any roadblocks to progress? Do we want universal, accessible and quality health care, with an emphasis on prevention, for all children, women and men in America, at long, long last? Do we want the repeal of restrictive labor laws such as Taft-Hartley which fuel the obstruction of trade union organizing for tens of millions of American workers who do not earn a livable wage? Do we want adequate budgets and do we have the willpower for enforcing and strengthening the environmental, consumer protection and job safety laws against corporate crime, fraud and abuse so often and well reported in the mainstream media but, alas, to so little effect? Do we want to end hundreds of billions of dollars of corporate welfare, the so familiar subsidies, giveaways and bailouts? Do we wish to discover the small and medium-size businesses in the Social Venture Network, and other places that believe in sustainable economies, like the Interface Corporation in Atlanta, Georgia, so as to refute the chronic nay saying of Big Business? Can we not move our rich country to become a society that abolishes poverty? Do we want an expansive transformation of our energy sources to the many kinds of solar energy, some of which have been around for centuries? Do we wish to advance the appropriate technologies that define efficiency and productivity as if consumers, environment and workers mattered? Do we want to elevate the many civil servants in our federal government above the demeaning stereotypes that politicians have pasted on them and liberated their knowledge, insights and imagination to make government our servant? Can we assure that these civil servants -- physicians, engineers, scientists, lawyers, cost analysts, procurement managers and others -- have a place where they can bring their conscience and ethics to work everyday? Do we want our own media, our own television, radio and cable networks as a functioning and deliberative democracy desires and needs? Do we want to reserve part of the public airwaves which the people own in the first place for programming that reflects our solutions, our cultures, our sense of the heroic and the many models of little known success that need to be publicized and emulated? Do we wish to so lift the horizons of the pursuit of happiness in our society through the pursuits of justice so that bigotry, discrimination and virulent intolerance recedes toward oblivion? Do we wish to expand the definition of national security and national purpose to show how, with reasonable amounts of knowledge, resources and goodwill, we can rapidly begin to defeat the global scourges of poverty, contagious disease, illiteracy, lack of shelter, environmental devastation, and to recognize the genius of Third World peoples to help it flower? Isn't it about time that the United States government stop supporting dictatorships and avaricious oligarchies with our tax monies, munitions and diplomacy? Isn't it time that our government takes a cue from numerous studies and model projects, and advances foreign policies that support the peasants and the workers for a change. Do we want to say to the 70 million non-voters, the Greens want to help you build a new beginning? Here is your chance to come forth and support what you have long wished for, a progressive movement that is for the people because it is of the people. To the contented classes in America, the top five percent on the income ladder, I ask, is your choice only to exit or is it also to voice? Your income enables you to exit and buy bottled water when you are concerned about the quality of your communities' drinking water, to send your children to private schools, and to move to some more pleasant community. But you are the people who can get your calls returned. You are the citizens who can give voice to the powerless and the beleaguered to improve their conditions. My classmates at Princeton University and Harvard Law Schools have chosen to voice. Over ten years ago our Princeton class of 1955 established a Center for Civic Leadership to place undergraduates in dozens of civic organizations dedicated to systemic change. The Center is also pursuing a major effort to reorder our public health budget so that a major assault on global tuberculosis can be mounted. In 1993, members of my Law School class of 1958 established the Appleseed Foundation that organized state-based Centers for Law and Justice. Over a dozen of these centers are underway, for the purpose of furthering systemic approaches to systemic injustices. How many other older alumni classes, undergraduate and graduate, can develop their systemic initiatives for building democracy and justice? A progressive political movement highlights civic energies which are dedicated to the proposition that a society which has more justice is a society that needs less charity. Too many good people are walking around with invisible chains which restrict their contributions to the good life for themselves and their fellow citizens. A progressive political movement liberates their wisdom, judgment, experience, creativity and idealism. To the millions of retired Americans with such capacities, a progressive political movement offers endless opportunities for this community-based patriotism to blossom. We need you in this fresh campaign. Small numbers of large corporations are playing roulette with the planet. To the youth of America, I say, beware of being trivialized by the commercial culture that tempts you daily. I hear you saying often that you're not turned on to politics. The lessons of history are clear and portentous. If you do not turn on to politics, politics will turn on you. The fact that we have so many inequalities demonstrates this point. Democracy responds to hands-on participation. And to energized imagination. That's its essence. We need the young people of America to move into leadership positions to shape their future as part of this campaign for a just society. Let's prepare to take the politicians and the lobbyists on a tour of the People's America. Two premises are basic to this political campaign. First, that a basic function of leadership is to generate more leaders, not more followers. Secondly, this political movement is first and foremost movement of thought, not of belief. There is nothing wrong with beliefs but it would be better to have them preceded by thought and followed by action. By debating, phoning, e-mailing, and marching during the next four months, we the people will grow a new political start, a green plant pushing up between the two fossil parties. With a new progressive movement, we the people have the ability to vastly improve our lives and to help shape the world's course to one of justice and peace for years to come. 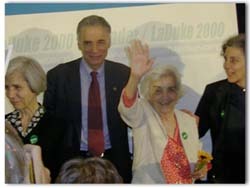 6/25/2000 - Ralph Nader and family after accepting nomination in Denver. 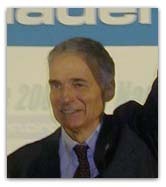 Contributions to Ralph Nader for President are not tax deductible for federal income tax purposes. www.votenader.com is the official campaign website of the Nader 2000 Primary Committee, Inc. "www.votenader.com", "votenader," and "votenader.com" are trademarks of the Nader 2000 Primary Committee, Inc. All rights reserved internationally. Copyright in all text materials contained in this website is owned by the Nader 2000 Primary Committee, Inc., � 2000. The text materials contained in this website may be used, downloaded, reproduced or reprinted, provided that this copyright notice appears in all copies, and provided that such use is for non-commercial or personal use only. The text materials contained in this website may not be modified in any way.